Schenkerla is a classic Bamber destination. We were lucky enough to visit and have a couple of pints with Matthias Trum in 2008. The brewery is recognized as the home of the traditional Bamberg smoke beer, which really is a throw back brew to the pre-1850s brewing style. 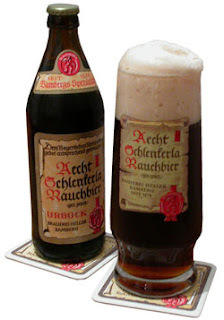 Tonight I had the chance to taste what was reported to be a 7-year-old bottle of Schenkerla Urbock. I trust the provenance of the bottle based on the other beers that were enjoyed along side of this brew. It was truly amazing. It opened as a brownish brew with a tan head and a big smoked ham nose. The taste was much more subtle, but still unique. One Wisconsin taster said it was like smoked sturgeon. I cannot argue. A great beer from a great brewery in a great town. I had the chance to try the Schlenkerla Fastenbier on draft last night at Vintner Wine Market. I enjoyed it, but was surprised to find it had a slight tartness or sourness to it. Apparently this is absent from the bottled versions, according to Jeremy at Vintner. I hope to try the Urbock and Marzen soon.